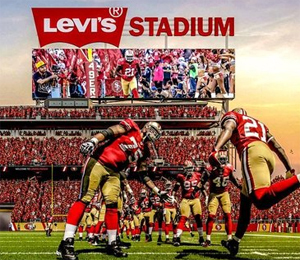 Home › Branding › 49ers to wear denim! Now that it is final that the San Francisco 49ers football team has sold the naming rights to Levi Strauss, I can’t but wonder what else Levi’s will do to get their $10 million a year money’s worth. No, the naming rights by themselves are not worth all that money. Especially since so few games are played each year in a football stadium. So it is the total package and other promo opportunities that really make this a great buy. We look forward to seeing how Levi’s does it right. At least they won’t be confused with any other Levi’s… like the big mess up when Candlestick Park was called Monster Stadium. Paid for by Monster Cables (which so few people know) – with Monster.com laughing all the way to the awareness brand bank. Other bloggers have speculated how to bring 501 into the equation as Levi’s is famous for their old 501 blue jeans – not that I have ever seen such a pair. My thought was it could be part of their address, but I see the next door training facility is already called 4949 Centennial Drive, so that won’t work. And the stadium is in the middle of the very long Tasman Drive, so unlikely to have a small number address there either. However, what about a short connecting road where the main stadium entrance is at 501 Blue Jeans Road?